In a paper prepared for the Foreign Commonwealth Office International Cyber Conference, MGI examines what more can be done to fully capture the benefits of the Internet. 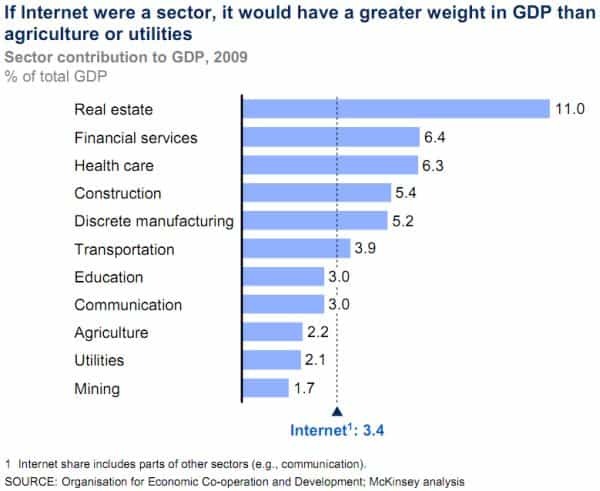 Internet accounted for 21 percent of the GDP growth in mature economies over the past 5 years. Two billion people are connected to the Internet. Almost $8 trillion exchange hands each year through e-commerce. Internet accounts for, on average, 3.4 percent of GDP across the large economies that make up 70 percent of global GDP. Internet’s total contribution to global GDP is bigger than the GDP of Spain or Canada, and it is growing faster than the GDP of Brazil. Internet has created 2.6 jobs for every one it has destroyed. The consumer surplus generated by the Internet in 2009 ranged from $10 billion in France to $64 billion in the United States. Read the full report: McKinsey & Company – Report – The great transformer: The impact of the Internet on economic growth and prosperity – October 2011. Previous story Does Your Small Business Need a Social Media Team?